J.J. Abrams realizes that what worked so well about his Star Trek was the setup of the characters and knows full well that with the sequel it has to be something more than just another Starfleet mission. He said, "It needs to tell a story that has connection to what is familiar and what is relevant." Abrams explains that in order for a Star Trek sequel to not just be another sequel, it needs to connect with the current generation and real life issues. He explained further, "There needs to be relevance, yes, and that doesn't mean it should be pretentious. If there are simple truths -- truths connected to what we live -- that elevates any story -- that's true with any story." 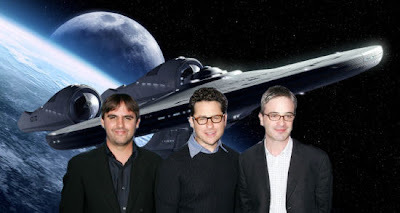 Roberto Orci touched on the same ideas as Abrams with Geoff Boucher telling the L.A. Times columnist, "We’re trying to keep it as up-to-date and as reflective of what’s going on today as possible." Boucher pushed (as any good reporter) for something a bit more specific by asking Orci if, "we might see Starfleet grappling with the ethics of torture or dealing with a rising terrorist threat or perhaps a painful, politicized war with the Klingons?" Orci was forthcoming telling Boucher he was on the right track. He said, "Well yeah, those are the kind of issues we're talking about...that's the way we're thinking, that's an approach." Having a sequel to Star Trek being more relevant to today's current issues seems like the right direction for Star Trek to move forward with the franchise. 2009 Star Trek laid all the ground work for the series to now tackle current issues as Roddenbuerry's original series did. Ritchie Directs 'Lobo' for WB!